TOGORU, Fiji, Jan 2 2018 (IPS) - The water is nibbling away the beaches of Fiji. Not even the dead are allowed peace of mind. 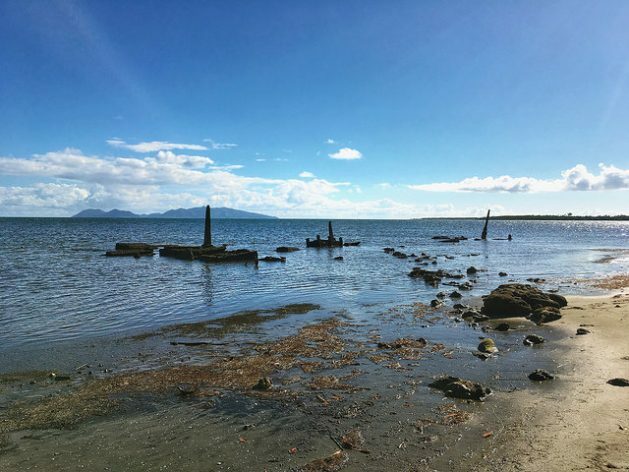 The graveyard of Togoru – a village on the largest island of Fiji – has been submerged. The waves are sloshing softly against the tilted tombstones covered with barnacles. The names have become illegible, erased by the sea. “Bula!” The Fijian greeting comes with surprise – no visitor ever comes this way. The village headman of Togoru was easy to find since only three houses are left of the village. On the beach, James Dunn (72) points to the drowned dead. “The village was even further behind the graveyard. In 20 years’ time, the sea has moved in a few hundred meters. The house where I was born is gone.” The patriarch remembers the graveyard being covered by the shade of the palm trees. Today, the trees are rotting in the surf. The soil around the roots is being washed away, until they fall over. Tree by tree, the sea moves deeper inland. The fields have become unusable for agriculture due to salination. The remaining village often gets flooded at high tide. “The waves knock on my door,” Dunn says. The ancestors of James Dunn are buried here, but he can’t visit their graves anymore. His great-great-grandfather came all the way from Ireland to build this village. That explains his extraordinary name for a Fijian. Five generations later, James is probably the last headman of a village on the frontline against climate change. Fiji and other South Pacific states are extremely vulnerable to rising sea levels. Most islands are low and remote, poor and insignificant. In the West, almost nobody cares. But the water has risen 25 centimeters on average since 1880, enough to wipe Togoru off the map. The village has already disappeared from Google Maps. “The sea is stealing our land,” says Dunn. “The beaches where I used to play as a child are in the water. We had horse races. That’s impossible now.” Togoru has built five sea walls in the past 25 years. None could cope the force of the advancing waters. If global warming is limited to 1.5 degrees, the sea level will still be another 50 centimeters higher. But even this most optimistic prediction spells doom for thousands of communities in vulnerable coastal areas. From the beach of Togoru, the Fijian capital Suva is visible. “The prime minister came here to visit. He said we have to say farewell to our village. Luckily, he isn’t abandoning us,” Dunn says. The government of Fiji recently published a list of 60 villages that need relocation. For a country with barely a million inhabitants, that’s a lot. The activist from Togoru was a guest speaker at the climate summit COP23 in Bonn (Germany), presided by Fiji. The small island state has taken up an outsized role at the conferences on climate change of the United Nations. It speaks with a loud voice to get attention. The micro-state on the isolated archipelago doesn’t have the means to battle the advancing sea. Any help from outside is welcome. ‘Vinaka’, thank you. Monthly, more than 80,000 tourists come to the white beaches and colorful coral reefs. But the resorts regularly have to level up their beaches. Sugar is the second pillar of the Fijian economy under threat. A growing number of sugar cane fields are being destroyed by salination. Fiji is responsible for only 0.01 percent of carbon dioxide emissions. But it is being beaten relentlessly by the climate storm. “When it was all over, everything was flat. I could see for miles.” Malela Dakui (53), the village headman of Rakiraki, who witnessed another phenomenon of climate change: extreme weather. On Feb. 20, 2016, Dakui hid under his table while wind gusts as strong as 325 kilometers an hour howled outside. Cyclone Winston blew away his roof, and his walls a few minutes later. The eye of the storm passed right over Rakiraki. The coastal village had experienced cyclones before, but never one with the force of Winston. Miraculously, nobody got hurt in Rakiraki, but elsewhere 44 people lost their lives. Winston was the most powerful cyclone ever to be observed in the southern hemisphere. It was also the most costly, at 1.4 billion dollars, a third of Fijian GDP. Two years later, Rakiraki has not been completely rebuilt yet. The village looks like an outdoor construction fair. Between the destroyed houses there are many construction sites. Building materials and tools are everywhere. Since Winston, nobody wants to live in ramshackle huts anymore. But solid houses are expensive. The consequences of climate change on the weather are undeniable, the village headman thinks. “The weather patterns are changing rapidly. The rainy season used to start every year on the same day. Now the seasons are broken.” Since his house was blown away, Dakui knows more extreme weather is coming. Nevertheless, he is lucky. Rakiraki is slowly being rebuilt. Other villages are lost forever. Climate refugees are not a new phenomenon in Fiji and Tukuraki is the unwanted champion of relocation. This village in the volcanic mountains of the Fijian interior had to move three times in five years. In 2012, Tukuraki got hit by a landslide after extremely long rains. Ten months later the temporary shelters were destroyed by cyclone Evan. The third village was wiped away by Winston. The unfortunate homeless villagers moved to a cave for a while. “For Fijians, land is the most important thing. It binds us. When we lost our land, we felt vulnerable and helpless,” says Livai Kidiromo, one of the village elders. The fourth Tukuraki is now his final home. The new and disaster resistant village was built with the financial support of the European Union. The modern dwellings can resist a category 5 cyclone, but offer no protection for the loss of their traditional way of living. “Bula!” Apparently no other foreigner ever defied the difficult road to remote Tukuraki. That adventure is rewarded with a traditional welcoming ceremony and lots of kava. Men chew the root of the kava plant and spit the mush in a bowl with water. The brownish drink is lightly intoxicating. The chewers explain that the price of kava has doubled since Winston destroyed the fields. The production hasn’t recovered yet. The new village is located on a plateau in the midst of an enchanting landscape. On the mountainside, the remains of the original village are visible from the new site. The jungle has retaken most of it. Only the church is intact. Climate refugees are a reality not just for Fiji. Samoa, Tuvalu, Vanuatu and many other neighboring islands are under threat. Kiribati is trying to prepare for its own demise, predicted for 2050. The government has bought 2,500 hectares of land in Fiji to relocate some of the 105,000 inhabitants when the last bits of dirt will be covered by water. In areas of coral reefs, the atols have kept up with sea level rise through the melting of the continental glaciers which raised sea level 120m in a few thousand years. The rate of sea level rise was way above the present rate. The difference was that humans did not occupy these islands and with each storm new material was added. Humans have over fished parrot fish which produce the needed sand and siganids which keep the reef free from algae. They have polluted the sea with nutrient run off. In addition we humans are killing the corals with sea temperature rise. If abandoned, many of these low lying islands will revert to being able to keep up with sea level rise.